and a heck of a lot of miniatures/ornaments. You can see the year's photo album here. I have a number of knitting goals for the year ahead. The first is to finish all the baby sweaters I have planned. I also want to continue to work to reduce my stash, because I know there's a lot of great yarn I have that I've forgotten about because it's been in the stash so long. I won't exclude the occasional yarn purchase every now and then, but I have several sweaters' worth of yarn already and plenty of sock yarn to keep me busy for a while, so there really isn't a need. Although I know I will likely have to have a pair of socks going at all times as usual, I'd like to focus more on larger garments in the year ahead, specifically sweaters and lace. It's gotten to the point where I could probably go about three weeks wearing a pair of hand-knit socks every day without having to wash any, so my feet certainly aren't cold. I wish all of you a very happy, healthy, and productive 2008! Thank you for your comments on Trellis. I'm glad that I can help some of you out by giving you my opinions on the pattern. I know there are many people out there who really like the sewing up and finishing of sweaters; I'm just not among them. I do want to add that the pattern makes for an adorable sweater, so I hope I didn't discourage anyone -- I just want you all to know what you're getting into! For what it's worth, I'm glad I knit it, because the reaction of baby Samuel's parents when I presented the sweater to them was priceless! I have no doubt that he'll be wearing it a lot once he gets big enough. Mods: lengthened the cuff by 1/4"
There's not much to say about the pattern -- it's easy, it looks great, it works so well with self-striping yarn, and it fits me perfectly. Simple and satisfying. I do want to give my two cents on this yarn. I loved it. It's quite soft, but it feels like it will be quite durable as well. 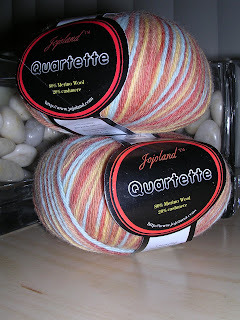 It's only slightly more expensive than my regular go-to sock yarn, and in my opinion it's well worth it. I'm hoping that in the new year Knit Picks will come out with some other colorways of the Felici; right now it's only available in striping colorways. This pair did mark an important milestone for me: For the first time, I didn't worry about the stripes on both socks matching up. In all honesty, this was probably due more to laziness than to "letting go," because the stripe sequence is quite long and I didn't feel like cutting and having a million ends to weave in. 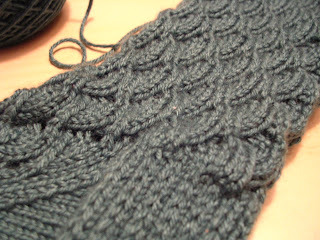 As usual, as soon as the ends were woven in on the second sock, I cast on for a new one. You see, I made a trip to Knit One yesterday to buy some gift yarn, but I could not resist the allure of this. It's definitely a different knitting experience, but I'm enjoying it thus far. I certainly hope the recipient of this sweater gets a lot of wear out of it, because I will not be knitting this pattern ever again. This sweater is adorable, but it was way too much work for such a small sweater -- maybe even too much for an adult-sized sweater. The knitting itself was fairly straightforward but required a pretty high level of attention given the cabled patterning. I cabled without a cable needle with the exception of the center cable crosses (worked over five stitches), which certainly helped speed things along. While the yarn wasn't the most pleasurable to knit with, given its high cotton content, it worked well with the pattern and makes for an extremely baby-friendly garment. The buttons are a pearlized brown plastic -- neutral but not cheap looking, in my opinion. 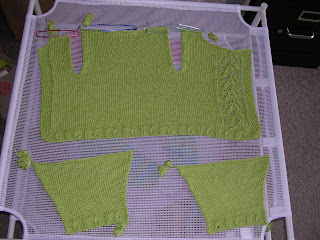 For those of you who might be considering knitting this sweater, here are a few words on its construction: The sweater is knit in five pieces (back, two fronts, and two sleeves). 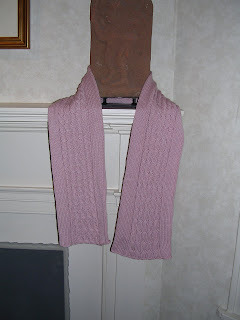 The lower hems and button bands are knit in seed stitch, and the background stitches on the cabled portions are worked in reverse stockinette. 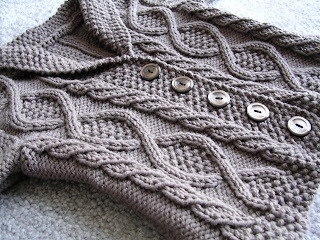 The button band stitches are placed on a holder at the beginning of the neck shaping and are later picked up and knit in seed stitch to form the collar. The two pieces of the collar are then grafted together at the back of the neck and the entire length of the collar is sewn to the neck opening. The collar is what gave me the most trouble. I couldn't find any resource -- online or in a book -- to help me graft seed stitch, so I had to wing it. It turned out okay to the untrained eye; a more perfectionistic knitter than I would have ripped it out and tried again until it was perfect. By the time I reached this stage of the sweater, however, I just wanted it done -- and I figure that in its location at the back of the neck, that particular seam is not going to be scrutinized. I then used a row of single crochet to attach the collar to the neck opening for some added stability and shape to the top of the sweater. So, in spite of how cute this turned out, there are several reasons why I didn't like this sweater. You all know how much I dislike seaming. 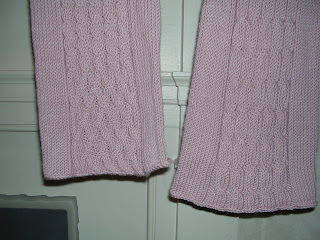 With this project, I discovered that I really don't like seaming reverse stockinette. I also didn't like the way the increases in the arms looked in reverse stockinette, and I didn't like trying to seam seed stitch. I didn't like how much finishing was involved for such a small garment. That said, the amount of time I spent finishing (seaming, weaving in ends, sewing on buttons) was much less than the time I'd spend on an adult sweater, and I do love how the sweater looks. 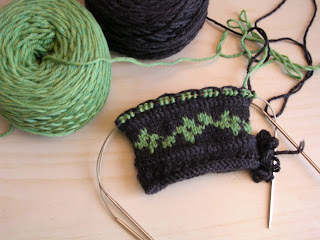 The pattern was pretty clear and easy to follow, but I'd rather spend my time knitting something else -- especially something with less work to do once the knitting is done. Using some leftover Knit Picks Sock Memories yarn (very old -- I think from my first Knit Picks order ever) and US 1/2.25 dpns, these took a whopping hour and half Friday night. 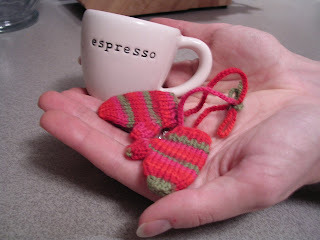 A little fiddly because they're so small, but a satisfying knit nevertheless. We'll be out of town (and away from the computer) until Wednesday. Merry Christmas to all of you celebrating, and happy winter to everyone! Sneaky quilter that she is, she poked around on Ravelry to find out everyone's favorite colors and then stitched us up some fabric-embelished mini moleskine notebooks. 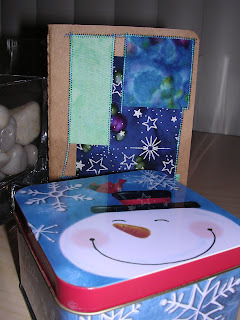 As if that wasn't enough, she also had a cute wintery tin for each of us filled with candy, stitch markers, and coiless safety pins. Ain't she sweet? I wish you were able to touch this yarn, a dreamy 80% merino/20% cashmere blend. I think it may be too precious to put on my feet, so this may be destined to become a Chevron Scarf. As if this new yarn weren't enough, I came home this evening to find my sock club shipment waiting for me! This was the first time I hadn't peeked at the spoilers ahead of time, and I'm glad I didn't. 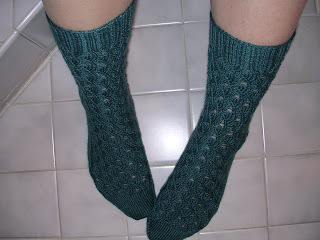 This colorway was by far my favorite one of the whole year -- and it came with a gorgeous Cat Bordhi pattern. I don't want to ruin the surprise for anyone still waiting for this shipment, but for those of you who want to peak, you can see it in my Flickr photostream. Tomorrow is my last day of work this year(!) and afterwards I have about a week and a half of knitting time to look forward to. Can't wait! These are for my swap partner for the Vintage Socks Swap. The recipient's feet are longer than mine, and having knit these socks for myself I knew the leg runs really long, so I knit six repeats rather than seven on the leg. In the end I was fine on yardage, but I think it was probably a good move; the cuff is only 63 stitches around, and if these went any higher there might be some problems with fit around the calf. The leg measures about 8 inches, which is longer than the usual 7" leg I do for my standard sock pattern. I just love this pattern, as always. It had been a while since I last knit it, but it only took about two rounds before I was able to put the pattern down and knit the stitch pattern from memory. It's a 10-row repeat, but if you do it for a while you'll find that it's really intuitive. I think this yarn was really well suited to the shell pattern as well; the sheen of the silk looks gorgeous in the curves. Now I just hope my swap partner likes them as much as I do! 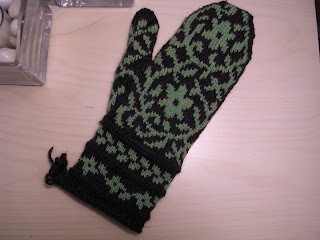 I'm going to hold off on the second mitten for the time being so that I can focus once again on Trellis. There really isn't all that much knitting left to do, and after indulging in a little knitting for myself I feel ready to get back to it. I'm still not sure what project I'll be bringing to this month's meeting of the Hurricane Knitters, but I will be there with yarn to swap (see the Ravelry message board for more on this) starting at about 7 p.m. this Wednesday. I'm using a skein leftover from The Mister's Seamless Hybrid and a skein left from my Central Park Hoodie. I really like the color combination. It's a little odd knitting with worsted weight yarn on sock needles (US 2/3 mm), but I think they will be nice and toasty when they're done. and the swap socks are moving along nicely. We're in the middle of a nor'easter this weekend, so we're all holed up and I'm planning to knit the rest of the weekend! My hands ache after working on this, but it's so worth it. Swap socks -- recognize the pattern? 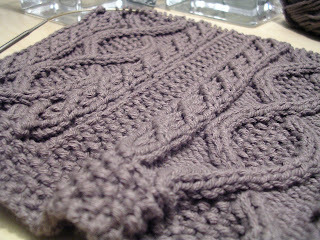 This is knitting up superfast and supergorgeous. It's really a shame I have to give these away. The finishing has been fast and furious here the past couple of days, including some last minute knitting and some very last minute blocking yesterday afternoon in order to finish up gifts for my parents (and give the finished items to them last night at our family Hannukah party). I'll try to keep the commentary to a minimum and just give you the facts. Very straightforward, and would have been very fast to knit had I not picked up all the other projects in the middle of knitting these. 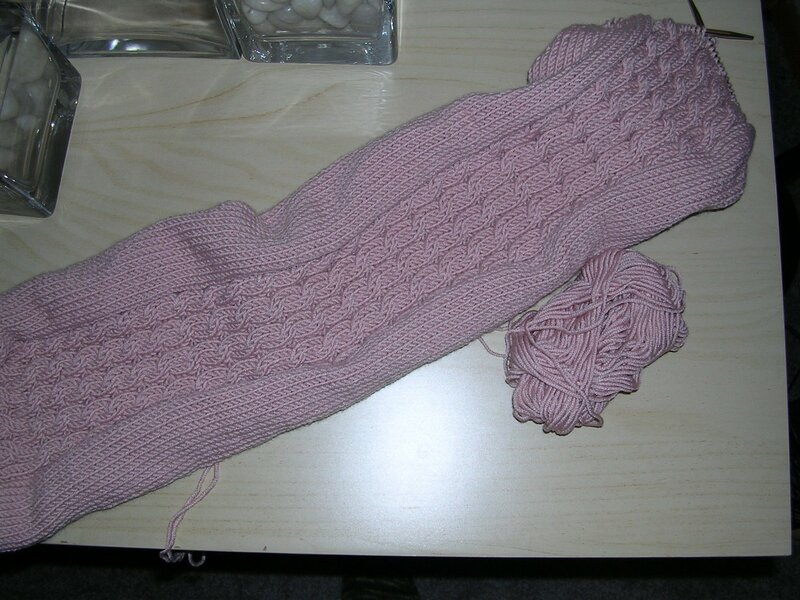 I am not in any rush to knit a tube scarf again. 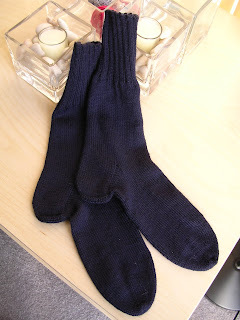 They're incredibly warm and are aesthetically pleasing because you can't see the wrong side, but they also take a really long time to knit and eat up a lot of yarn. In hindsight, I probably had too many stitches around, and even though I used almost every bit of the five skeins of yarn, the finished scarf (before blocking) was a mere 46" long. I didn't have time to wet block, which is what I really wanted to do to maximize the length, but giving it a light spray of water and a good long steam managed to get it to a full 5 feet of length. This last FO was an unplanned project that I cast on for late yesterday afternoon in anticipation of meeting our friends' newborn son today. 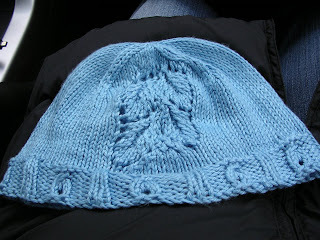 This picture was taken in the car on the way to meet baby Tyler, and the hat is still damp from washing (for some reason a spin in the dryer didn't work). It's way too big for him now, but I told Tyler's mom to throw it in the washer and dryer to get it to shrink a little bit, and it should fit better by the time he's big enough to wear his matching sweater. 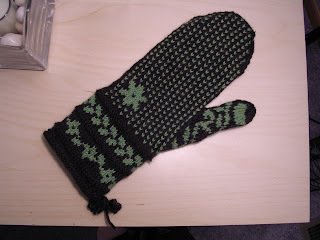 So, now I'm all caught up and the holiday knitting is officially complete. I do want to thank all of you who gave me good tips on spinning and spinning resources. I'm definitely going to continue to explore this new fiber hobby, but I've also got a lot of baby knitting to do. I think I may sign up for the spinning workshop for the Pittsburgh Knit & Crochet Festival in February (anyone care to join me?) by which time I hope to have completed many cute little things. And, if by then I decide I really like this spinning thing, a couple months will give me some good time to start a wheel fund! My little present to myself arrived today, and I couldn't wait to open it up and experiment a little. Because really, could you open up a package containing 8 oz. 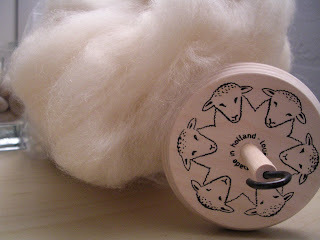 of beautiful natural fiber and a spindle decorated with sheep this cute and not play with it? 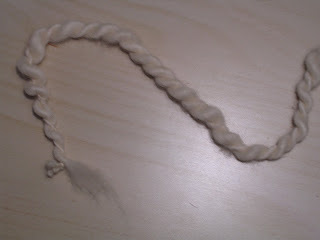 I think I need a proper lesson in spindle spinning (or just plain spinning, period) before I waste any more of this fiber. Anyone know of a good spinning teacher in the Pittsburgh area? I am pretty far behind on my holiday knitting, and it looks like I'll be needing every bit of Saturday to finish in time. The second sock for my dad is at least into the foot, but I've got a good 5 or 6 inches of foot and a toe to go, and I'm still only on the fourth skein (of five) of my mom's scarf. I hope you'll understand my cutting this post a little short -- and I hope I'll be able to post with not one but two FOs next time! 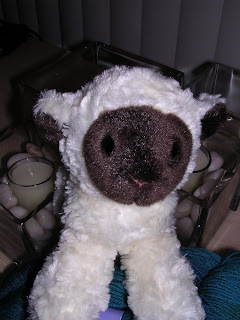 Now, as cute as this little lamb is, he's not the Hannukah miracle. Nope, it would be the other surprise that was awaiting me this evening, and part of it is what he's sitting on. 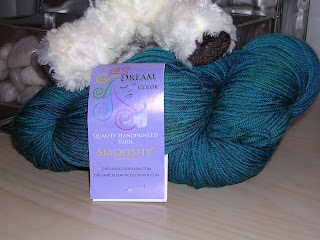 Thine eyes do not deceive you: That is indeed a skein of Dream in Color Smooshy, in a delectable colorway called Blue Lagoon. This photo has actually captured the color quite well -- it looks like a teal, but up close you can see the gentle gradations of greens and blues. It is so me. This came as part of prize package from Devorah (aka Mama Squid) for having the closest guess for the total mileage for the Squid on Wheels this year. She also included two delicious looking Jacques Torres chocolate bars and a fun NYC souvenir keychain. I had no idea what kind of yarn she'd select -- she only asked my fiber and color preferences. I have no idea how she knew I'd been coveting the Smooshy! Thank you, Mama Squid! 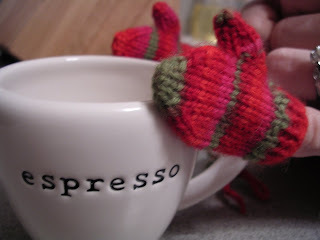 Just a reminder: Tomorrow is the first Wednesday of the month, which means knit night for the Hurricane Knitters. Come and join us! ETA: Damn you, snow, cancelling our knit night! How on earth is it December already?! I really feel like I missed a month somewhere along the way. 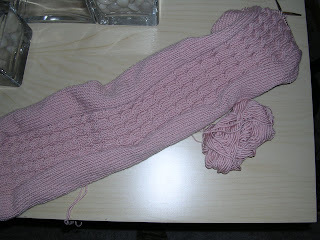 There is a lot of knitting left to do and not much time left in which to do it. I spent most of last week making novelty yarn scarves for my office hallway sale. I was a little disappointed that only about three of them sold (leaving me with many more novelty yarn scarves than I'd like), but I was happy that I made a good chunk of change that's going to a good cause. 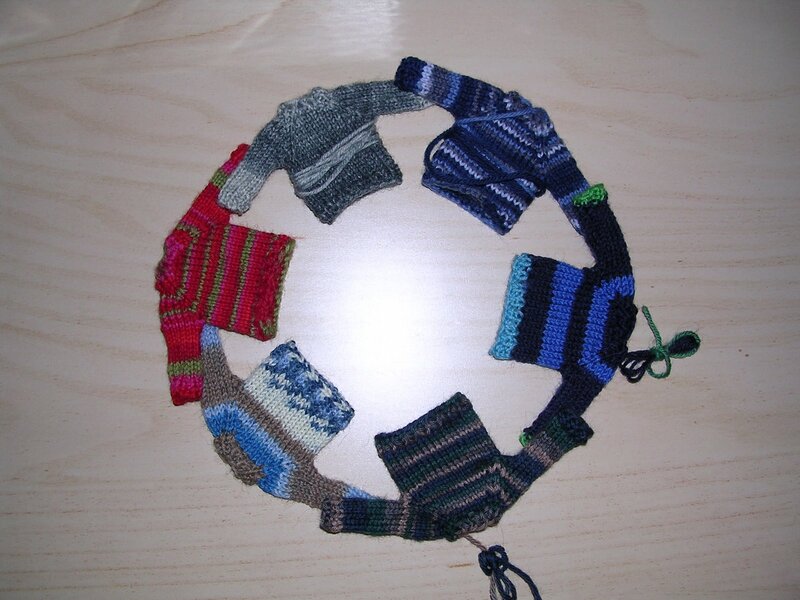 For some reason I can imagine the sweaters singing "Kumbaya"
I've completed only a few socks; something tells me that people will think pint-sized sweaters are a lot cuter than miniature socks. This will need a good blocking before it goes to her, and it will probably need a couple days to dry, which means that the knitting needs to be done by Thursday. There are two skeins left to be knit after the present one, so if I can manage to knit a skein's worth of yarn each night I'll be okay. Of course, once I'm done with all the holiday stuff, there are all the babies to knit for. Two are due next month, four are due in March, and one is due in April. 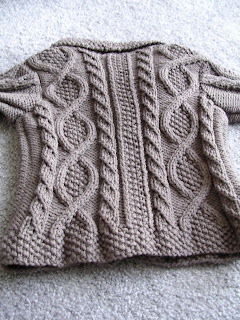 And then there's my aunt's sweater to knit (at least now I have the yarn for that). 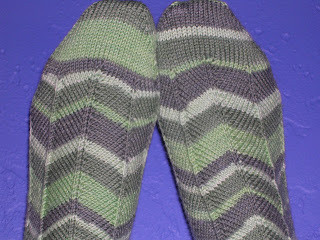 Oh, and a pair of socks for a swap to be knit this month and mailed out the first week of the year. 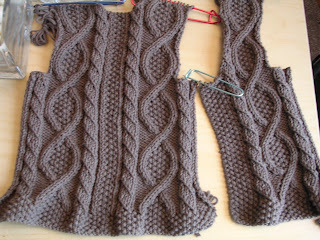 It looks like it might be a while before I can cast on for me again -- I suppose Tangled Yoke will have to wait a bit!